Singaporean fans of Sandara Park were treated to a glimpse of the K-pop star last Tuesday. She was in town to grace the opening of Kate Spade New York’s first ever global pop-up store in ION Orchard. The pop-up store was to celebrate and unveil Nicola Glass’ Spring 2019 collection for the brand. The Spring 2019 collection was created in loving memory of the late Kate Spade, who passed away in June 2018. Nicola Glass had been said to be keeping Kate Spade’s spirit ongoing through the billion-dollar company. This collection is Glass’ debut with the brand after joining as creative director in 2018. Sandara’s fans noticed her arrival immediately and the venue soon erupted into cheers for the singer. All eyes were on Sandara as her charismatic presence lit up the atmosphere! Dressed head-to-toe in pieces from Glass’ collection, Sandara definitely looked like a breath of fresh spring air. Despite it being a fashion event, many fans were spotted holding banners of support for Sandara. She gave warm fan-service as she noticed the banners and waved to the fans who certainly missed her. Despite filming beauty show Get It Beauty On The Road in Singapore last May, the last time she performed here was for 2NE1’s All Or Nothing World Tour back in 2014. Sandara even stopped to give her autograph to a few lucky fans! She then left the pop-up store after she had a short tour around and gave an interview, before proceeding to ION Sky for a cocktail party held for the launch. 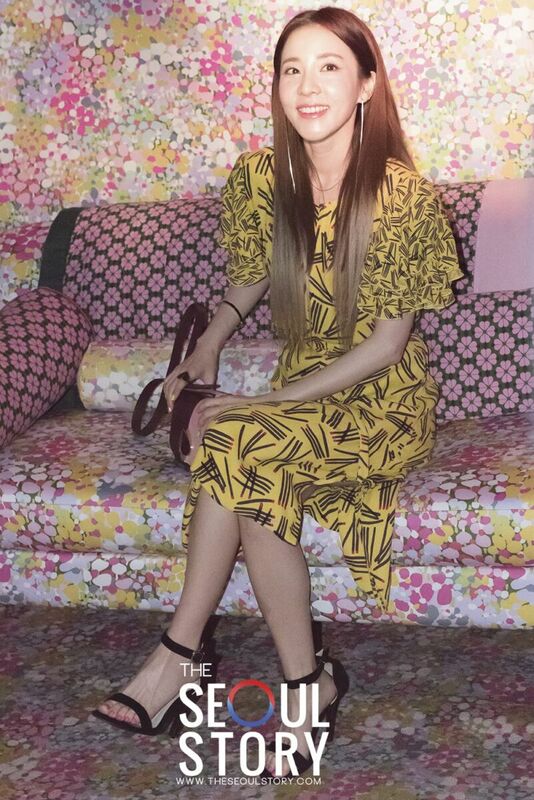 At the cocktail party, Sandara posed for pictures against a beautiful photo wall designed with colourful flowers that embodied spring. Her smile never left her face as she posed cheekily with three different types of hearts, to which everyone fawned over! The event was simple yet fun, a perfect embodiment of the brand and Sandara’s presence certainly highlighted that too. We would like to thank Kate Spade New York for inviting us! Do head over to our Facebook page for more stunning pictures of Sandara at the event. THE SEOUL STORY RANDOM GIVEAWAY!